Several recent research papers and books have made it possible to follow the rise of book production in Europe. The crucial event was the invention of the printing press by Gutenberg around 1440, after which the efficiency of book production increased, prices decreased and consumption of books subsequently increased. This post will give an overview of the history between 500 and 1800. Estimates of manuscripts produced between 500 and 1500 based on a database of 17,352 manuscripts produced in Western Europe. Estimates of the number of books printed between 1454 and 1800. The unit of analysis for the estimates of manuscripts is the number of individual manuscripts. The unit of analysis for the estimates of printed books is (new) &apos;title&apos; or &apos;edition&apos;. The authors corrected the numbers to account for the underrepresentation of estimates for different geographical regions and different times. The authors consider their estimates to be conservative and note that the “figures should be interpreted as low estimates”. 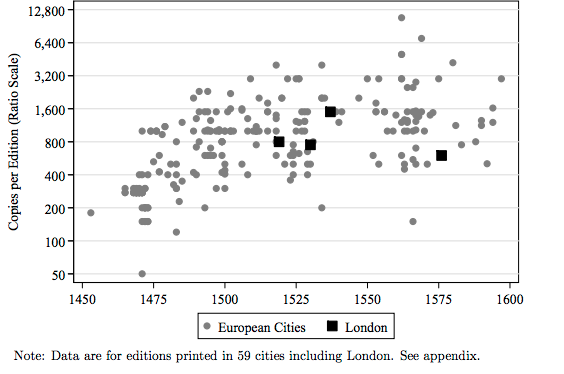 The rise of the actual number of books is even greater as Dittmar (2012) shows; the number of books printed per edition rose 1450-1600 as depicted in the first figure below. Buringh and Van Zanden 2009 note that the aggregation of the data to country levels obscures inequalities within countries - &apos;if we could isolate data on, for example, northern Italy or the north of France (including Paris), these regions rank much higher in output per capita&apos;. The growth of the book sector in Western Europe over the 1300 years studied by the authors is enormous. Until the year 700, around 120 books per year were produced, but a millenium later in 1790 20 million copies were printed. The most decisive development for the increased book production was the invention of the printing press. Buringh & Van Zanden note: "in the year 1550 alone, for example, some 3 million books were produced in Western Europe, more than the total number of manuscripts produced during the fourteenth century as a whole". The increased demand of books was driven by a huge decrease in the price of books. The smaller price was possible by the increased efficiency in the production of books since the invention of the printing press around 1440. 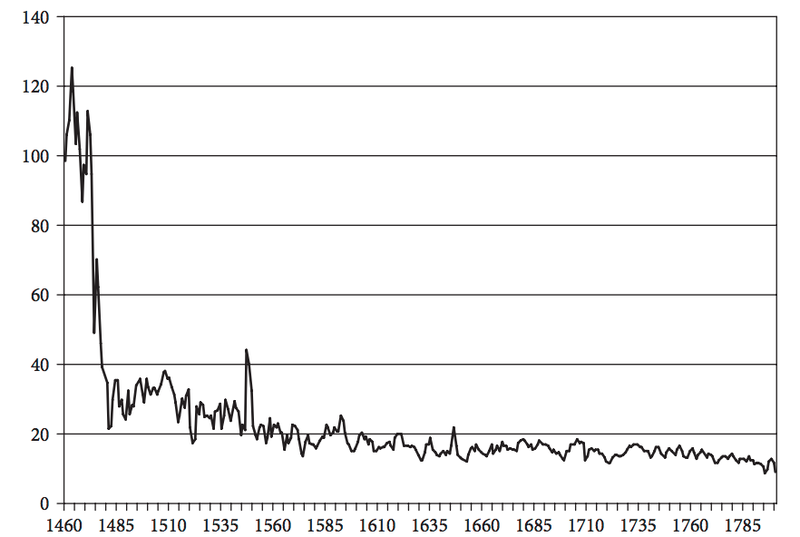 Clark (2008) measures the subsequent productivity increase as the ratio between the wage of building craftsmen and the price of a book and finds a 20-fold increase in productivity in the first 200 years after the invention, as shown in the following graph. Clark (2008) notes that copyists before the time of the printing press were able to copy 3,000 words of plain text per day. This implies that the production of one copy of the Bible meant 136 days of work. Eisenstein5 is able to compare the price of paying a scribe to duplicating a translation of Plato&apos;s Dialogues with the price for duplicating the same work by the Ripoli printing press in Florence in 1483. For three florins the Ripoli Press produced 1,025 copies whereas the scribe would produce one copy for one florin. This implies that the cost per book decreased 341 times with the introduction of the printing press. A long run perspective of the real price of books in the Netherlands between 1460 and 1800 is depicted in the figure below. Another fundamental change in the book market after the invention of the book press was a very strong increase in the variety of printed books available to the readers. Dittmar (2012) measures the subject content by employing techniques from machine learning to identify the topics of books in his sample of English books between the late 1400s and 1700. He can thereby identify a specified number of topics in his sample and track the changes in variety over time. 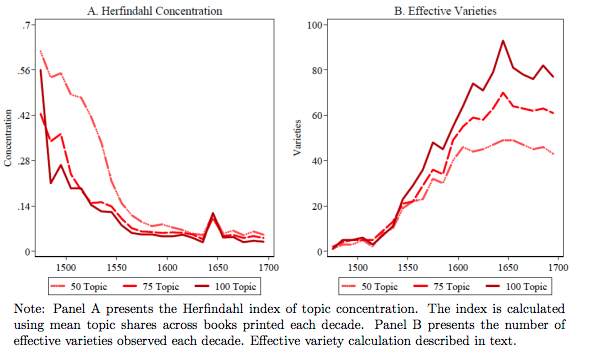 He depicts the increased consumer choice by calculating the Herfindahl index of topic concentration – this is reprinted in Panel A of the figure below. Panel B shows how the number of effective variety of consumer choices grew sharply after 1500. The increasing variety represents the end of the dominating role of theological texts – Dittmar (2012) notes that &apos;almost all books were on religious topics in the late 1400s&apos;. 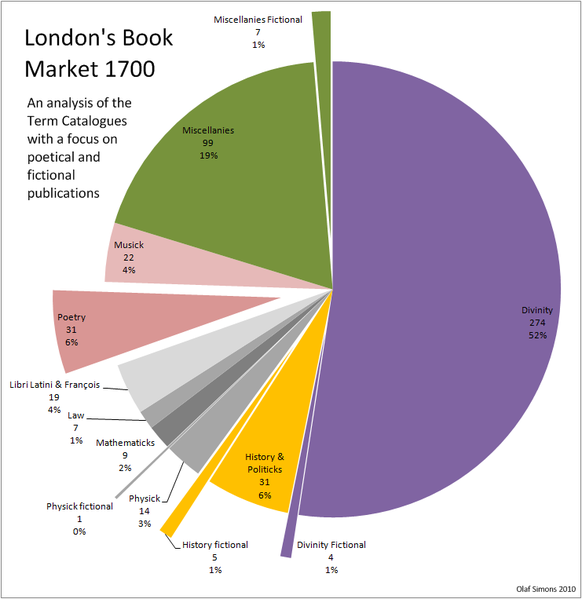 The following pie chart gives an overview of the variety of book topics in London&apos;s book market in 1700. Looking at the variety of books at that time – the end of Dittmar&apos;s sample – makes one realize how dominant theological texts were before. 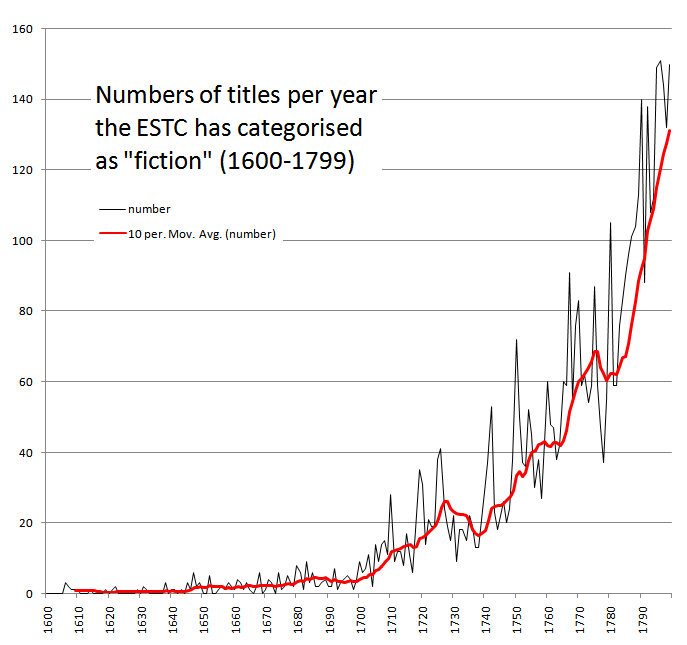 The data source for this figure is the English Short Title Catalog or ESTC which is also one of the two sources of Dittmar. A subsequent change in the variety of topics was the rise of fiction literature. This marked change between the 17th and the 18th century is depicted below. From the table above we know that the total number of books published during this time did not change – in the 50 years before 1700 89,306,000 books were published in Great Britain; in the 50 years after 1700 it was 89,259,000. The declining price of books and the increasing literacy led to an increase in the consumption of books, as can be seen in the following table. This table is identical to Table 1 in Buringh and Van Zanden (2009). a Hungary, Slovakia, Poland, and the Scandinavian countries. b England, Wales, Scotland, and Ireland. This table is identical to Table 2 in Buringh and Van Zanden (2009). a Austria, Hungary, Portugal, Czech Republic, and the rest Scandinavia. This graph is taken from Dittmar (2012) - "The Welfare Impact of a New Good: The Printed Book" (2012). This Figure is taken from Clark (2008) - A Farewell to Alms: A Brief Economic History of the World (Princeton University Press, 2008). Productivity is indexed to 1 for the 1470s. Eisenstein (1980) - The Printing Press as an Agent of Change (Cambridge University Press, 1980). This data is from van Zanden (2009) - The Long Road to the Industrial Revolution: The European economy in a global perspective, 1000-18001st Ed. (Brill, 2009). This figure is taken from Dittmar (2012). This figure is from Wikipedia. This figure is taken from Wikipedia. 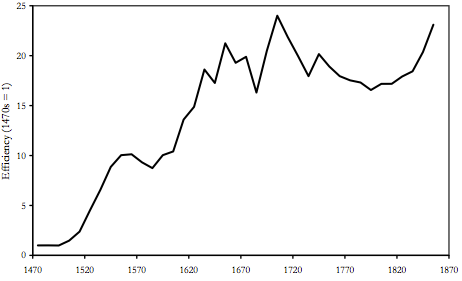 This data is from table 4 in Buringh and Van Zanden (2009) - "Charting the ``Rise of the West'': Manuscripts and Printed Books in Europe, A Long-Term Perspective from the Sixth through Eighteenth Centuries", The Journal of Economic History 69, 02 (2009), pp. 409--445. The authors corrected for imports and exports of books. (a) Austria, Hungary, Portugal, Czech Republic, and the rest Scandinavia. Data is originally given for half centuries and is here printed at the the midpoint of the time it refers to: "1775" here refers to 1751–1800 in the original publication etc.